For 99% of their lives, our chickens have it pretty darn good. They are regularly spoiled with healthy treats that they love, everything from tuna to tomato to lactose free yoghurt to blueberries and watermelon and many other treats in between. They have a large chicken pen where they can safely roam. They have a great chicken coop plus an indoor run where they can hang out if it rains, and an area underneath that which mostly remains dry where they can dust bathe even if it is raining. They have food and water inside the indoor run itself, plus several choices of water to drink from in the large chicken pen. Most days they get to “free range” a grassed area, garden beds, and hidden away safely from most prying eyes, they have their own special leaf litter dustbathing extravaganza. And if all of *that* wasn’t enough, they have two owners – Snoskred who loves to observe them and notes when one of them is Not Feeling Great, and The Other Half who grew up a country boy and is able to handle them very deftly when required, plus he is technically crafty and can create solutions when they need them. We have needed the latter this week and Snoskred has begun to learn more handling skills herself. On Good Friday I began to notice something a bit off about BeeGee. 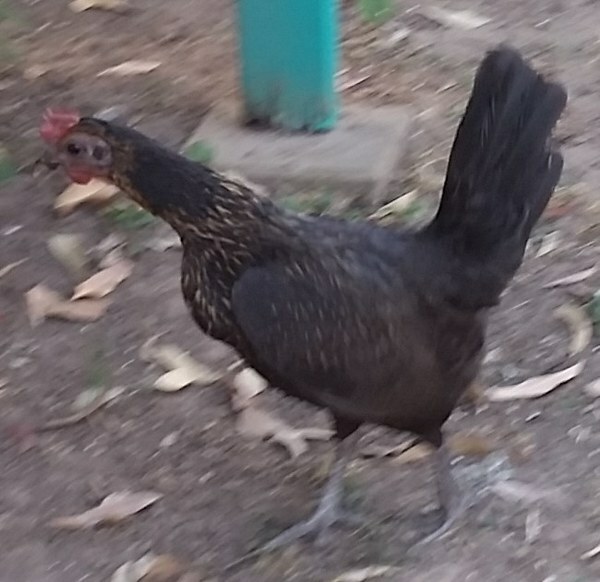 She was not her usual speedy self, and seemed to be having some trouble with reaching the ground to peck. It almost seemed like her crop was swollen – the crop is the area all food goes into once it is swallowed. It is kind of a chicken fuel holding tank, before it moves into the stomach. Most of the time when something goes wrong with a chicken the best thing is to observe. As long as they are eating and drinking and pooping and flocking, many issues do resolve of their own accord. 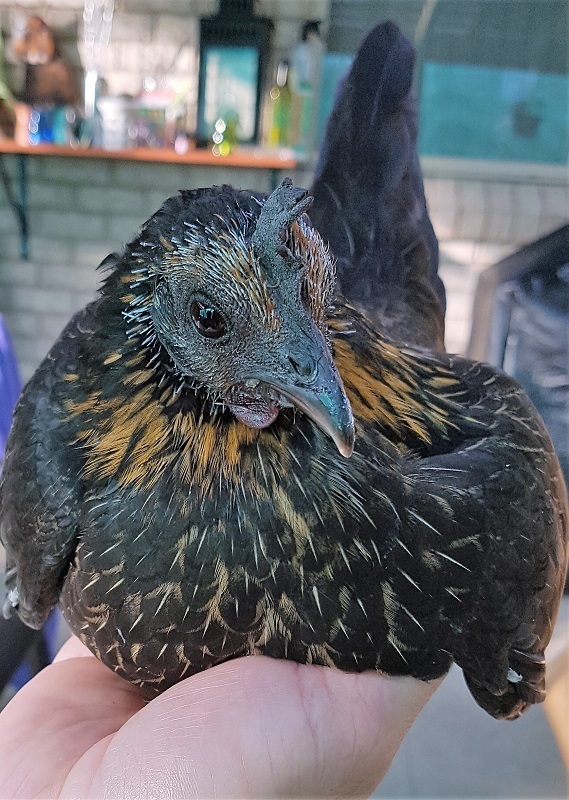 It can be difficult as a chicken owner to know when to step in, especially when your girls are a bit flighty and catching them causes stress on its own. 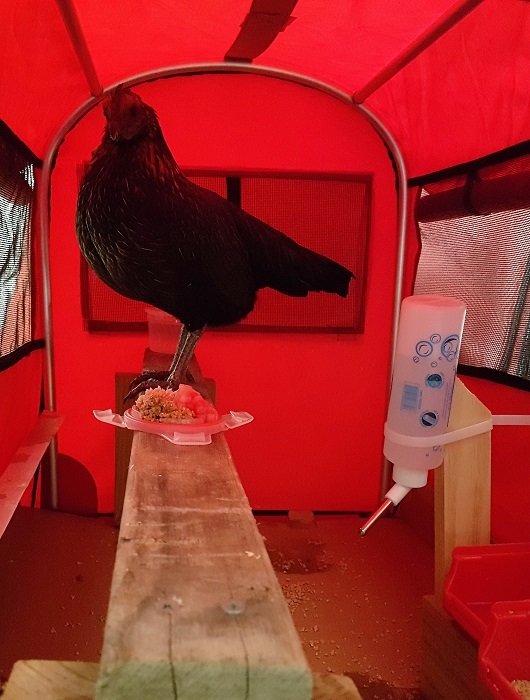 The next morning – Saturday – the swelling had mostly gone down and she ate her food like a normal chicken. As the day went on, however, we began to notice that swelling again, and when I took them a treat of tomato in the afternoon she did not show a lot of interest. I figured some lactose free yoghurt might be a good idea, and she certainly did not miss out on any of that. My general rule is, as long as they are eating, drinking and pooping, we observe and don’t intervene – and if we do have to examine the chicken more closely in that instance, we would do it at night time once all the girls get up on the roost and are less.. upset about humans because they are half asleep. So after the yoghurt, we’re back to observing her some more. There are some exceptions to this rule but this post is going to be long enough. Another time. On Easter Sunday, she was not at all interested in the scratch mix, and I could see she was pretending to be a chicken – pecking at the scratch but not actually picking any of it up. That decided our next course of action – catch her, put her in a carrier and head to the vet. Of course it had to be Easter Sunday, so this would be an Up Money vet visit. I’m firmly of the belief that you buy it, you bought it, you take care of it whatever it costs. 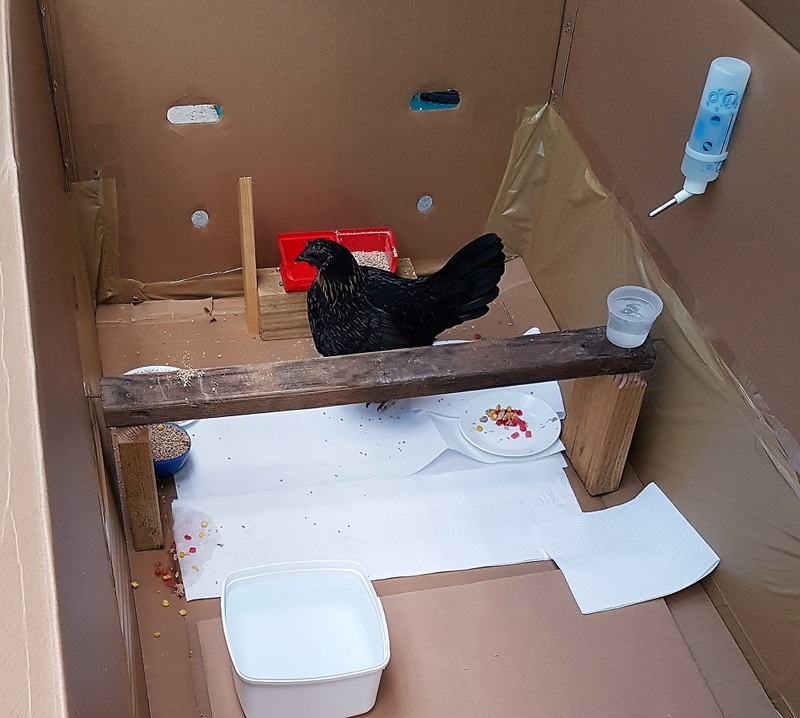 We were not sure what the outcome would be or even if our well versed in chickens vet would be available – sadly she was not and the vet on duty admitted she knew a little but not a lot. As a chicken owner that can happen fairly often – many times we’ve done our research and we know more about what could be happening than the vet we were seeing. Even if you do get lucky and have a vet with loads of chicken info, chances of getting a solid diagnosis are pretty slim. The vet did find a temperature variation with one leg, which could mean there is something going on in that leg. Chickens do a lot of jumping and they can sometimes injure themselves. 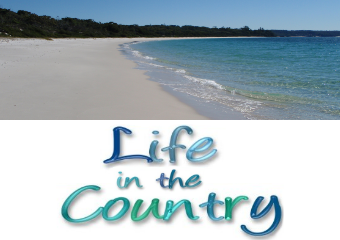 But it could also be a host of other things, everything from ear mites to a stroke. She was off balance, that was for sure. We came up with a plan of treat with anti-inflammatory, isolate, syringe feed if necessary, and see how she does. We also included in this plan to dose all the chickens with Ivomec which treats external and internal parasites aka worms, mite and lice. This is something we do from time to time, though it has been a while since we’ve done it. We do have a zip up tent we can use for isolation. 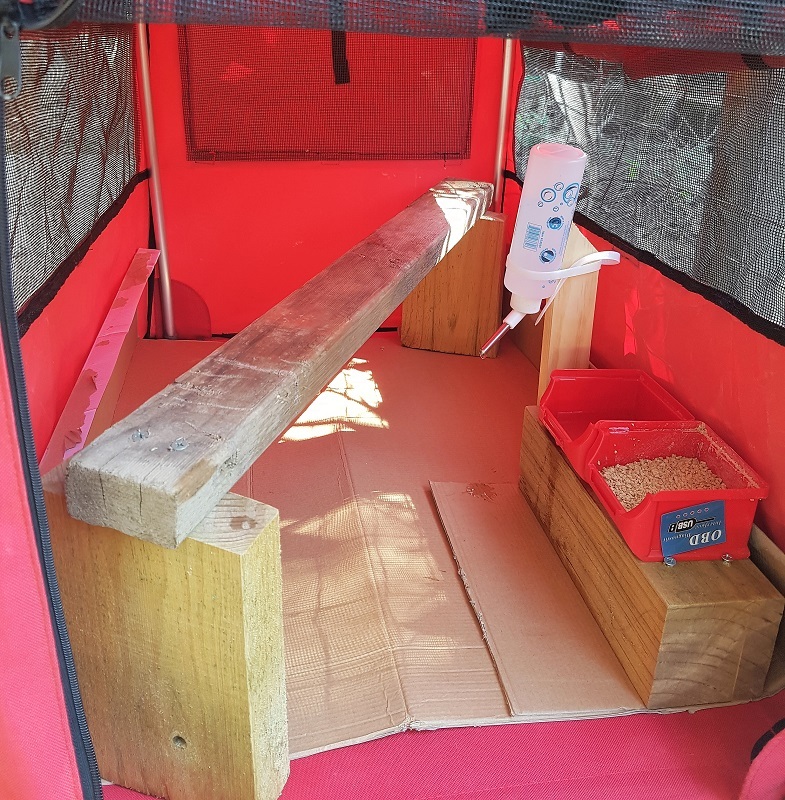 So on arrival home the tent was set up with a roost, a feeding and water station, and a cardboard base for easy cleaning. I personally find isolating a chicken to be Tough Work, not for them, but for *me*. It is really difficult when a girl cannot be a part of the flock, out in the world living her best chicken life. If you isolate for too long they will lose their place in the flock and have to fight for it all over again, so you want them to be in the best shape possible before you re-introduce but it is difficult to know what shape they are really in when they have a small area to reside in. BeeGee is an incredibly sweet girl though she has always been of the opinion that humans should stay a respectable distance away from her. Since becoming ill she has decided humans are not so bad, and is quite happy to sit on us and be given medication or food. 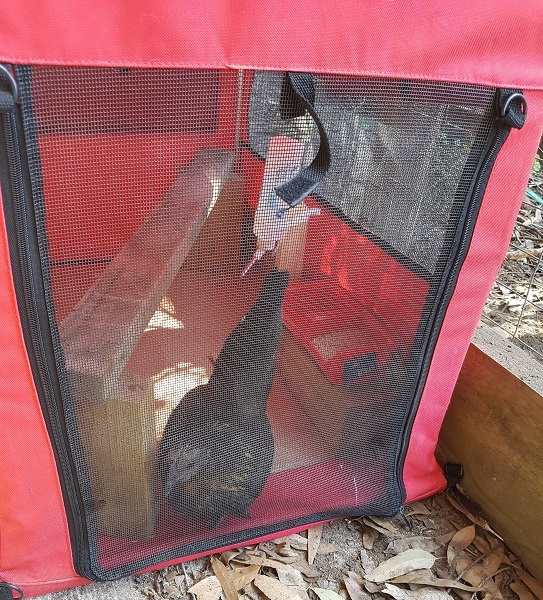 During her sick tent time thus far, we have had many discussions – she talks in chicken which I can speak. Of course I have no idea what I am saying, but she does not seem to mind. By Easter Monday we were able to get some fluids into her each time we gave her medication, and she was eating watermelon, tuna, sweet corn, and soft chicken crumble mash. One minute you think things are going well and she is eating up a storm which is always a great sign, the next minute you are not so sure, the following minute you think something really terrible and unfixable is wrong with her due to a new symptom you spot or – warning tmi – a not so great poop. We think the medication is the cause of that. 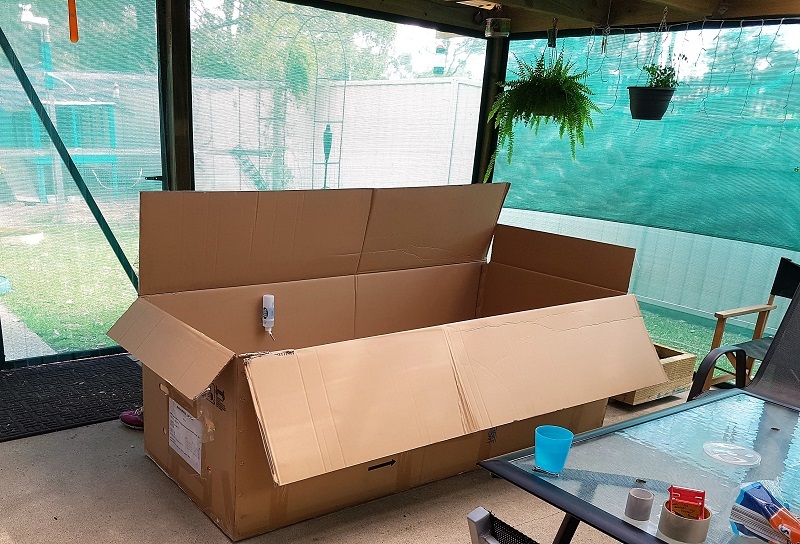 On the Tuesday after Easter, we were starting to feel like she needed a bit more space to move around, so The Other Half looked for a large box while at work, and we set up Sick Chicken Palace. This box is huge! First we laid in a plastic table cloth. 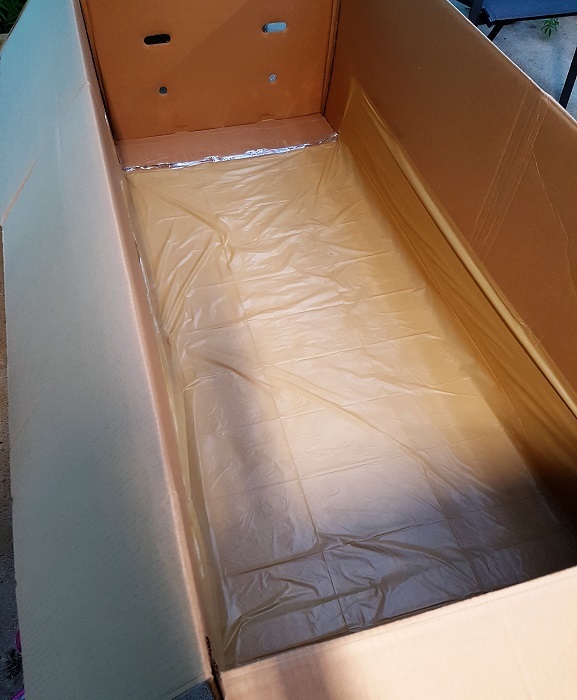 Chickens can be messy- everything from spilling water to food to pooping – and we wanted to protect the base cardboard. Really, there are only two things missing in here – a dustbathing box, and some turf, and you would have everything a chook needs in one convenient spot. And considering that she might be here long term, we may well add those things in. Wednesday she was eating and drinking on her own. She was still not very steady on her feet, but she was now able to reach the ground and peck and eat. In the afternoon I went out and sat her on my lap and offered her all manner of treats but the only thing she wanted was chicken crumble and water, and she ate a fair bit of that which made me very happy. After she finished eating I sat there with her for an hour, with her falling asleep and me supporting her head with my hand. I’m getting very attached to this chicken by now. Things took a turn for the worse over the weekend but it is a bit of a long story, for another blog post. Right now on Sunday evening, Beegee is resting in a smaller box indoors and we are keeping a very close eye on her mostly by a video camera stream so we don’t have to bother her too often in between her regular feedings and waterings. We do have a diagnosis – it is an ear infection, plus another infection internally. If it were just one of those, there would be a good potential outcome but the two together makes it less certain. Not much sleep has been had in Snoskredland the last two nights, we’re both pretty exhausted. This chicken is a fighter and we will do everything we can to help her win. She is comfortable, she is receiving antibiotics and pain medication which is helping her and she has everything she needs close by plus two doting humans to attend to her every need. Please keep a good thought for my lovely Beegee. :) I will update on Wednesday. Here’s a cheer for Beegee. I’ll check back Wednesday. I hope your girl is feeling better soon! It would be wonderful if our pets could tell us exactly what’s wrong so we would know how to help. Indeed good thoughts for Beegee. Beautiful girl, and your care of her is incredible. I’ve never had much to do with chickens, but my boyfriend Henry has them, and they are delightful. I didn’t realize how lovely and personable they are. You certainly done everything you can think of to help her feel comfortable, I do hope BeeGee pulls through and is back with the flock soon. Sending hugs to you and BeeGee.